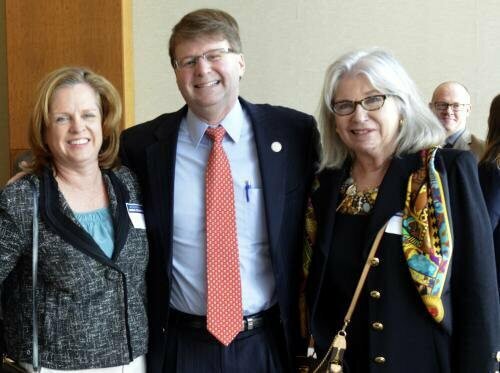 Norelli Law’s Nancy Black Norelli and Donna Parker Savage hosted a table at the ninth annual Justice for All Luncheon at the Westin Charlotte on March 12, 2015. The luncheon was hosted by and supports Legal Services of Southern Piedmont (LSSP) and Legal Aid of North Carolina-Charlotte (LANC). The Honorable Mark Martin, Chief Justice of the North Carolina Supreme Court and Chair of the North Carolina Equal Access to Justice Commission, was the keynote speaker. Martin highlighted the need for and the work of ensuring access to justice for the Charlotte area’s low-income community. See the photo at the right of the Chief Justice provided courtesy of Nancy Pierce. More than 600 guests heard addresses by Martin and civil legal aid and local bar leaders, stressing the importance of serving low-income families and individuals whose basic human rights are threatened by their inability to pay for legal representation in civil legal matters. Attendees heard the stories of North Carolinians protected from violence, homelessness and chronic illness through the work of these organizations and their partners. LSSP’s legal work focuses on helping people in the Charlotte-area meet their basic human needs, ensuring that low-income children, families and the disabled have access to quality health care and benefits; preserving income and protecting financial stability of low-income families; and providing targeted legal assistance for people with special needs such as children, elderly and disabled persons, immigrants, veterans, and people living with HIV/AIDS. LANC-Charlotte seeks to protect victims of domestic violence; help workers remove barriers to employment; preserve homes, automobiles and other essential properties that are subject to seizure and sale; and help tenants prevent homelessness by preventing unlawful evictions and helping them get necessary repairs for safe and habitable housing.